Mr. Ban "calls for an immediate end to the violence and for an investigation, as well as for humanitarian assistance to the victims and their families," his spokesperson said in a statement. The UN Organization Mission in the DRC (MONUC) has reported that at least 70 people were killed in several towns in Bas Congo province amid violent clashes following controversial recent local elections. The Mission has deployed two teams to the area to probe the situation and also sent police reinforcements. Deploring the violence, Mr. Ban appealed to the Government and the opposition to work together to bring the perpetrators to justice. 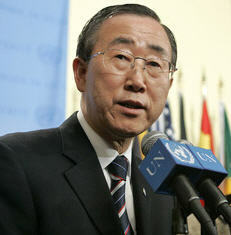 "He calls on security forces to refrain from the disproportionate use of force, and on opposition parties to pursue their electoral grievances through peaceful and legal means," the statement said, reiterating the Secretary-General's call for "inclusiveness, transparency and dialogue in the political process." The Council echoed that call in a statement to the press read out by Ambassador Peter Burian of Slovakia, which holds the rotating presidency this month, after a briefing on the DRC by Under-Secretary-General for Peacekeeping Operations Jean-Marie Guéhenno. Mr. Burian said Council members were particularly concerned that the clashes had taken place "at the very time when the new institutions [of Government] are being installed and when the country must strive towards peace consolidation and reconstruction." The DRC's Prime Minister Antoine Gizenga announced the formation of his Government yesterday, several months after landmark presidential and parliamentary polls - the largest and most complex electoral-assistance exercise undertaken by the UN - were held. Those elections capped off the DRC's transition, helped by MONUC, from a six-year civil war that cost 4 million lives in fighting and attendant hunger and disease, widely considered the most lethal conflict since World War II, to gradual stabilization. Mr. Ban called yesterday's announcement "an important new step in the country's progress" and stressed the importance that human rights and the rule of law are guaranteed. Mr. Burian said Council members wanted the Government to immediately tackle the many challenges it faces, especially the need for sustainable economic and social development, "which is key to long-term stability." Speaking to reporters after today's Council meeting, Mr. Guéhenno said last week's clashes in Bas Congo indicated the need for further security sector reform in the DRC so that the police and military can respond to threats to law and order without leading to greater violence. "It is very important that no part of the country feels excluded from the political process," he said. "I think in the month and the years ahead there are lots of talented Congolese who will be very important, that they can all mobilize together, and that they are part of that collective effort." But he added that the DRC has made enormous progress since the civil war and a review is now being conducted to determine what MONUC's major tasks should be during the next phase of reconstruction. The Mission's current mandate is due to expire on 15 February, and the Council is considering a draft resolution that would extend it beyond that date.